One of the primary purposes of the Northwest Alabama Arts Council (NWAAC) is art education. Since its inception in 2004, the NWAAC has instituted programs involving students from kindergarten through the twelfth grade in our local schools. Some programs are short, while others have now grown into full-time programs. The vast majority of funding for the NWAAC art education programs comes from proceeds of our two hosted festivals – the Jerry Brown Arts Festival (JBAF) and the Buttahatchee River Fall Festival (BRFF). Monies raised within the Marion County area stays in the Marion County area to support our students and our schools and our communities. Resources for our art education programs are provided by many of our festival artists through the arts council’s "Visiting Artists Program," in which JBAF and BRFF artists return, oftentimes from many miles away, to our schools and share with students their special skills and talents, providing students with opportunities for hands-on exposure to art forms often unknown to many of those students. Another resource for our arts council and students is the Continuing Education Department of the Hamilton Campus of Bevill State Community College. Partnering with Bevill State, the NWAAC and BSCC work together to place certified art instructors into local schools to work with students who show interest in the arts. 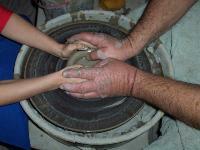 Created in 2007, a program for elementary school-age children entitled "Molding Hearts, Hands & Minds" gives 25 students the opportunity to work with Smithsonian potter Jerry Brown and exposes these young students to the techniques that have been used in the pottery business over nine generations of the Brown family. Brown is only known traditional potter still using a mule-powered pug mill in the entire United States. These 25 students receive three hours of personal instruction from Brown, including the production of their own, individual piece of pottery by working with Brown on his wheel, putting their hands in his; and then with their own hearts, hands, and minds, mold the clay into their artistic masterpiece. Participants in the program have their pieces of pottery displayed at the Jerry Brown Arts Festival, held annually the first weekend of March in Hamilton. After their works are judged, the Top 5 participants are selected and awarded scholarships by the NWAAC to the Bevill State Community College Arts Camp scheduled for June of each year. Created in 2007 by the Northwest Alabama Arts Council and the Alabama State Council on the Arts, this program is providing the opportunity for certified art instructors from Bevill State Community College – Hamilton Campus to go into all Marion County high schools and work with interested students over a two-month period during January and February each year. Interested students work primarily in the field of drawing. All drawings go through a selection process, and those pieces of works of the highest quality are displayed at the annual Jerry Brown Arts Festival. At the festival, those drawings are judged and the winning students are awarded monetary prizes for first, second, and third places. The Northwest Alabama Arts Council created in March 2010 a "Reflections of the South" Art Scholarship, which will provide a one-time $500 award to a Marion County public high school senior pursuing a career in the arts. The scholarship will be awarded to a senior who has been engaged in the study of visual arts in high school and who intends to continue art studies in college with a goal of having a career in the arts. Art forms include painting, sculpture, photography, graphic design, architecture, arts education, or art museum work. The scholarship funds will be provided for the purchase of art supplies. Applicants are restricted to attendees of Brilliant, Hackleburg, Hamilton, Marion County, Phillips, and Winfield high schools. Applications are available from guidance counselors at each school or by clicking on the link below. Deadline for the completed application to be received by the Northwest Alabama Arts Council is April 30, 2016. Announcement of the scholarship winner will take place at the winning student’s senior awards day ceremony.